I’ve always been a fan of Steve Martin. Well, earlier Steve Martin anyway. Some of the later films just don’t hit my comedic spot, and I don’t think trying to bring back Clouseau was a good idea at all, but The Jerk, Dead Men Don’t Wear Plaid and The Man With Two Brains are phenomenal comedy films and, if you’ve ever caught any of Martin’s comedy shows, then you know how treated you felt afterwards. Martin Short, on the other hand, I knew very little about. Obviously, I had watched The Three Amigos but the era that he appeared on Saturday Night Live coincided with it being Billy Crystal’s SNL era, so I don’t even remember him from that. I was aware the two gentlemen were friends though, so I pressed play and hoped for the best. The show starts with the two comedians sharing Hollywood insults and backhanded compliments and not quite hitting their rhythm yet, despite some of the insults bringing out some belly laughs. When they comment upon each other’s family photographs the humour builds and is accompanied with some self-deprecating remarks that bring a chuckle, especially Short with his “voted most likely to marry a cousin” and Steve Martin telling the South Carolina audience the tale of how he and Chevy Chase told Short that they were required to attend the premiere of The Three Amigo’s in full costume and then backed out leaving Short the only one dressed up. This seemed to relax the audience slightly (it might just be me but the audience didn’t seem into the show at all and the performers had to work possibly too hard at the beginning). Then Steve Martin and his friend take a seat and the show calms down from a very shouted and over excitable introduction and into more of a calm storytelling scenario. Steve Martin has a lot of stories from his illustrious career but holds back on a few, allowing Short to regale the audience with some of his own memories of working on Saturday Night Live, what it was like spending time with Frank Sinatra, and try out a few, very good, impressions. The Saturday Night Live memories were a highlight for me but Steve Martin’s story of Elvis and the three guns is worth tuning into the show for all on its own. 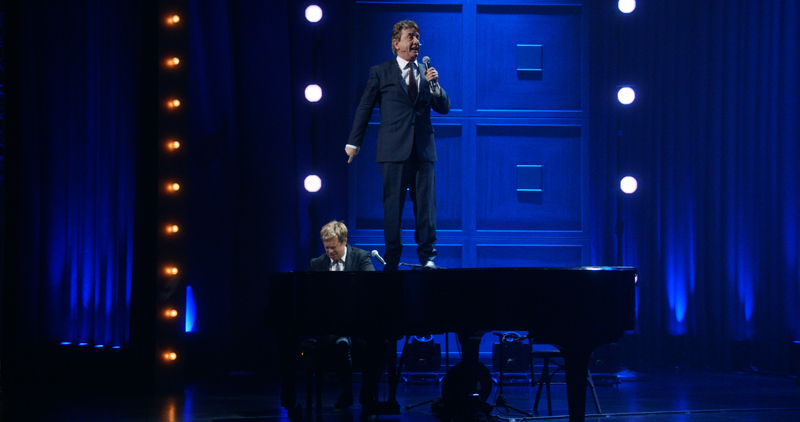 Exit Steve Martin and its time for Martin Short to get the stage all to himself for a while, accompanied on the piano by the very patient Jeff Babko. It's hard to believe that Martin Short is 67 years old, firstly he doesn’t look it, because he expels so much energy and nervous enthusiasm at the same time as telling some great jokes and very funny stories. Some are topical some a little older (“I’ve been on Jenny Craig more times than Mr Craig”) and all seem to make the audience love him that little more. He ends his little segment with a song, and he has a great voice, from his off-off-off-Broadway production, and Step-Brother to Jesus was an hilarious way to end. 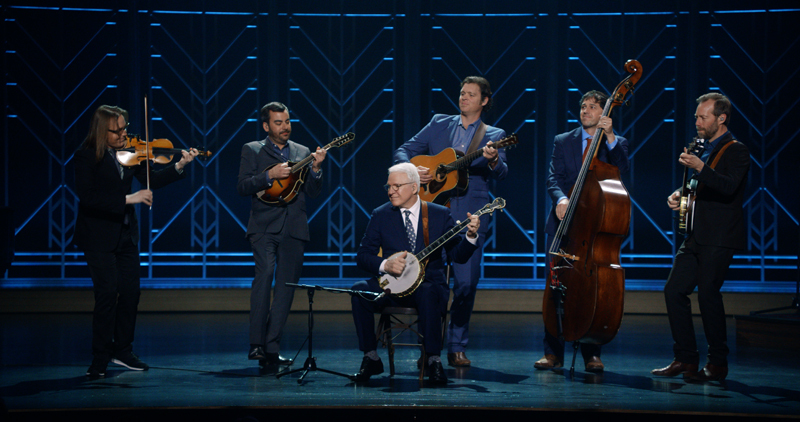 Steve Martin returns to the stage carrying his banjo and it was at this point I know many people who switched off. I didn’t. Steve Martin is an accomplished Banjo player and can be very funny and entertaining whilst playing the instrument. I enjoyed this section of the show, it was quite the respite from the zaniness of Short’s set, but I understand those people who don’t appreciate that kind of thing. 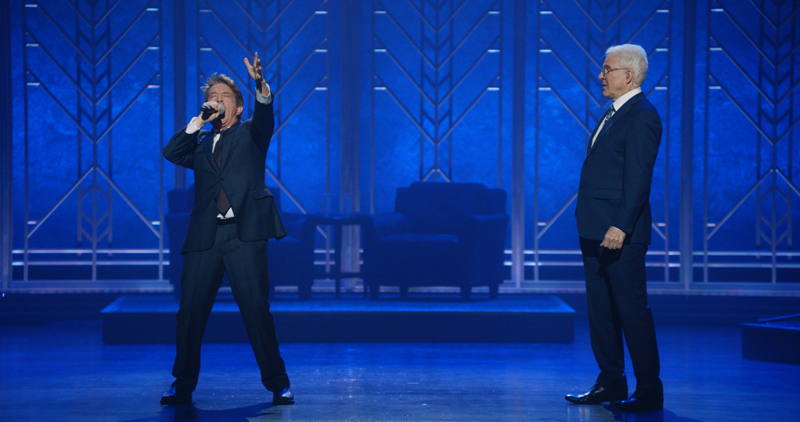 Having Martin Short rejoin as dummy to Steve Martin’s ventriloquist shows that these two old professionals still have it. 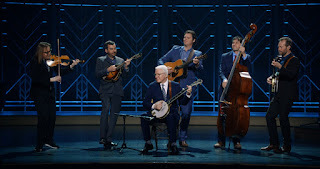 The entire skit had me in stitches, the Sarah Huckerbee-Sanders Imodium comment had me creased up in tears, and their finish, with the Steep Canyon Rangers band, was entertaining enough even with the Netflix lawyer song seeming a bit forced. Overall? I’ve seen Steve Martin be better, I’ve seen tighter shows, I’ve seen funnier shows, and I’ve experienced better audiences (honestly, they reacted to very little and I felt for the performers on more than one occasion) but I still enjoyed the just over an hour. 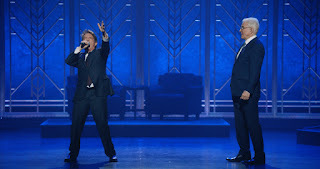 Steve Martin showed glimpses of why we love him and Martin Short showed why maybe we should love him more, just edging it for me on performance and material. Worth an hour of your time and if your Netflix algorithm is as good as mine it will recommend A Bit of Fry & Laurie afterwards.